DIAMOND BAR, CA—Quail Summit Elementary hopes to take a page out of author Linda Kranz’s books and encourage students to make the world a better place. After the entire school read the story, Only One You, staff members came together to create a place where children could believe in hope, peace, and reflect on their futures. When Kranz arrived for an Author’s Day celebration on April 3, the school unveiled a heart-shaped rock garden created in honor of the special guest. 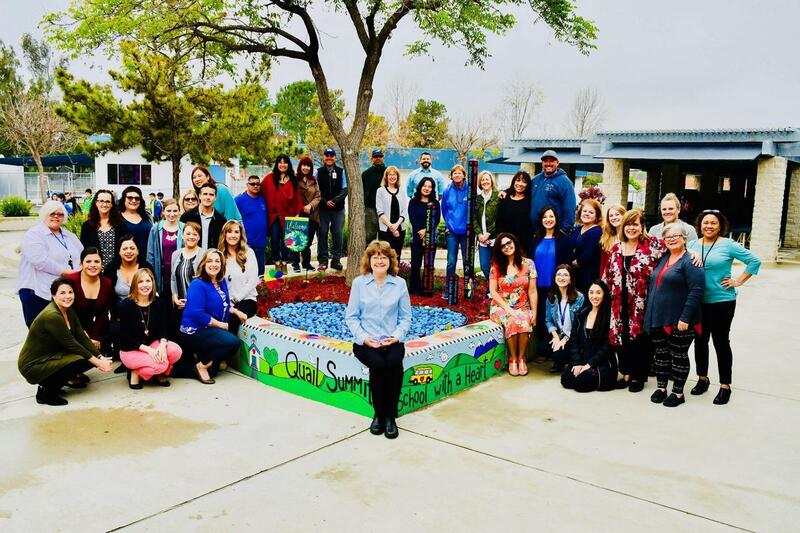 “Thank you for writing your books and inspiring us to transform nature into this fabulous oasis of heartfelt words of wisdom,” said Principal Frances Weissenberger. 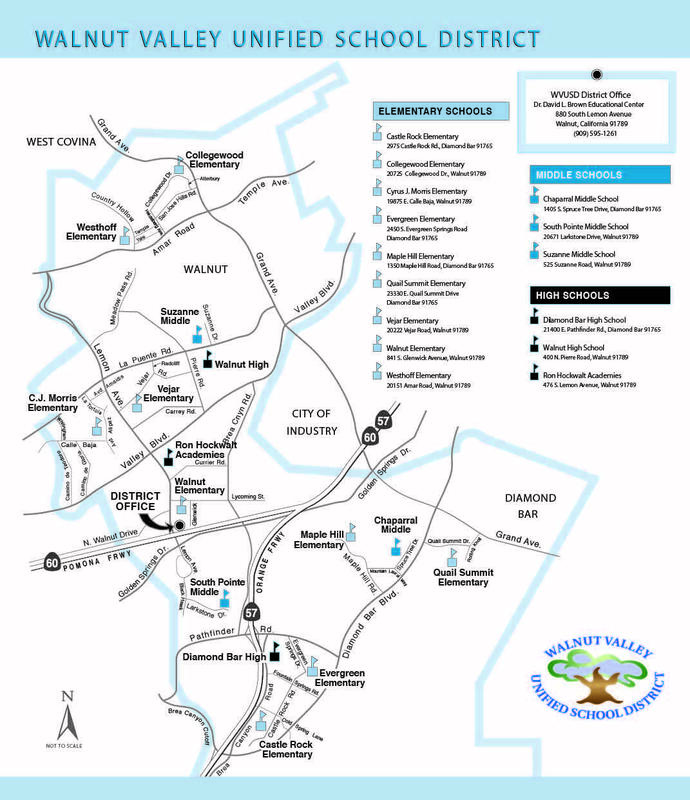 “Only One You is a simple book, but very deep,” said elementary learning specialist Leann Legind who spearheaded the plan for the outdoor art exhibit. 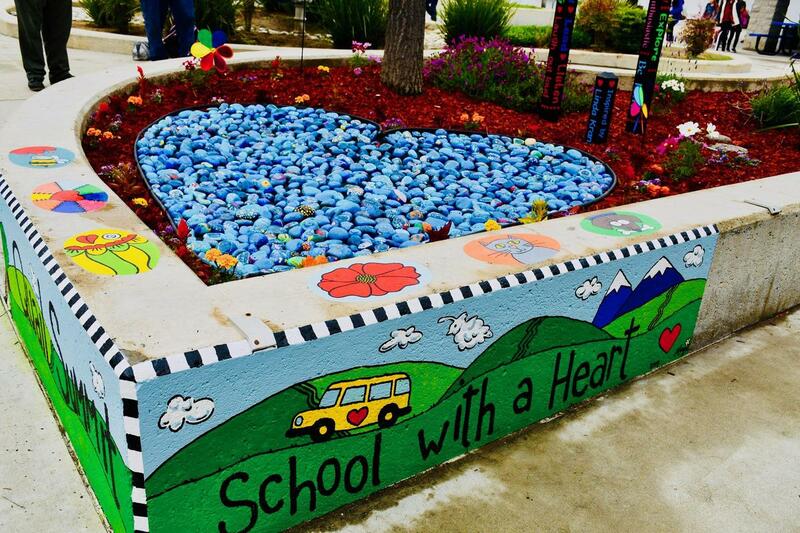 District grounds workers skillfully prepared the area by planting colorful blooms, shrubs, trees, and a heart feature filled with hundreds of decorated rocks. About 640 kindergarten through fifth graders painted the blue stones with inspirational words that were then lacquered and added to the display. The Diamond Bar students encouraged schoolmates by writing “Dream Big, Courage, Calm, Happy, You Are Special, and Shine Brightly” on their rocks. “The goal of this creative project is to help our students inspire their peers with these messages,” Legind said. Resident artist and former parent Margot Bloom painted a mural on the surrounding concrete with fish, flowers, and animals in the rock-painting style of Kranz’s works, and the ‘School with a Heart’ motto. Special education teacher Geri Smith constructed and painted three inspirational poles of wisdom with quotes from Kranz’s books. “It’s a beautiful, tranquil spot,” Legind said. Bloom said she kept in mind everything that was important to the school while designing the artwork. “If you look closely, you’ll see a cloud in the shape of a quail!” she said. After the ceremony, Kranz hosted four Author’s Day assemblies that culminated with students taking a close-up look at intricately painted river rocks featured in her books. 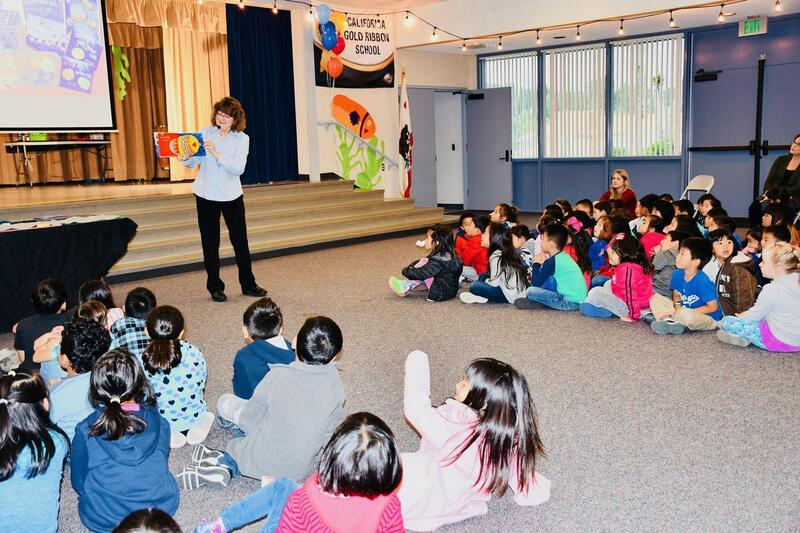 Kranz said she illustrated over 350 one-of-a-kind fishes for children’s books, Only One You and You Be You featured during the reading celebration. “I’m overwhelmed by the beauty!” Kranz said as she added her signature to the outdoor rock garden. The Great Reveal! 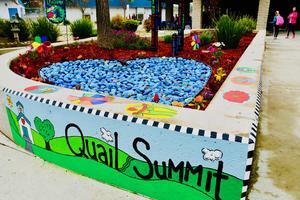 On April 3, Quail Summit Elementary surprises author Linda Kranz with a heart-shaped rock garden created in her honor. 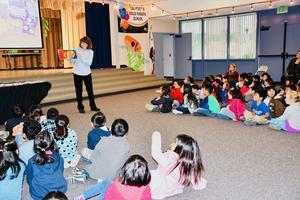 Author Linda Kranz reads Only One You during kindergarten assembly at Quail Summit Elementary on April 3. 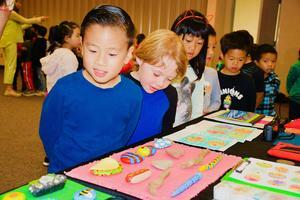 Quail Summit Elementary kindergarteners file by author Linda Kranz’s rock artwork.